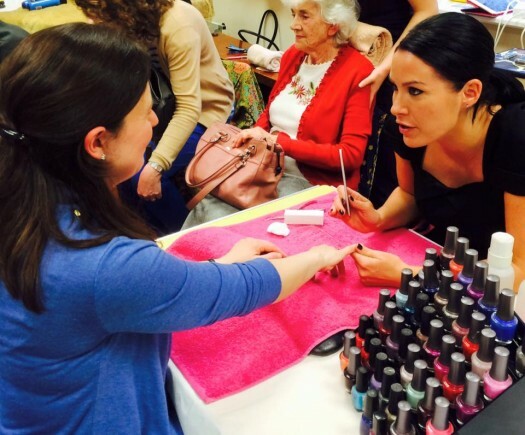 Careline Celebrates 20 Years Supporting The Community! 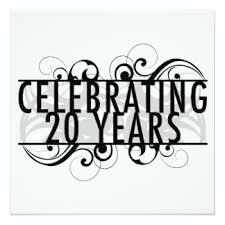 Did you know that Careline turns 20 this year? We’ve got lots of things planned to help us to celebrate our momentous anniversary, so please keep an eye on our Facebook and web pages for up-to-date information on how you can join in too! 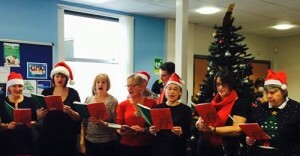 A Huge Thank You From the Staff & Trustees of Careline Following a Successful Year’s Fundraising! 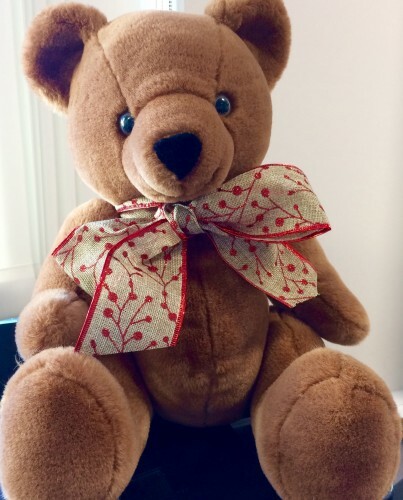 Careline would like to say a huge thank you to the community for continuing to support us this year. Early in 2016 the Ashbourne Telegraph published an article explaining that the majority of our funding had been cut and in it we asked for support to help keep the service running. And that’s exactly what you, the community have done! 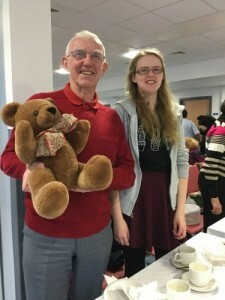 We would also like to thank all those people who have been involved in our fundraising events either in volunteering their time or as a guest – you have contributed enormously to ensuring that we are able to maintain our regular telephone befriending calls to the elderly and most vulnerable members of our society. This time of year is particularly difficult for many older people with the days being so short. Research tells us that loneliness and a lack of social interaction can be as bad for your health as smoking 15 cigarettes a day; in addition more than half (51%) of all people aged 75+ live alone in the UK and nearly a fifth of those people spend zero hours with other people on a typical day. We are still searching for that elusive large scale funding, but thanks to all of our supporters we are able to continue running the service for the foreseeable future. 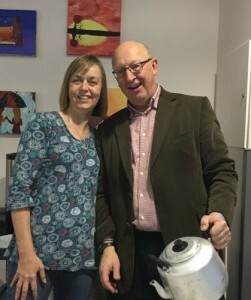 The Staff and Trustees at Careline. 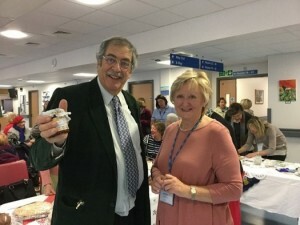 Fantastic Result for Careline Christmas Coffee Morning! Thank you to everyone who came along, bought raffle tickets or made donations to our recent Christmas Coffee Morning – what a festive time we all had, raising £1642.00 in the process! While we strive to try to find a source of long term funding, it’s reassuring to know that the community continue to support us so wholeheartedly. 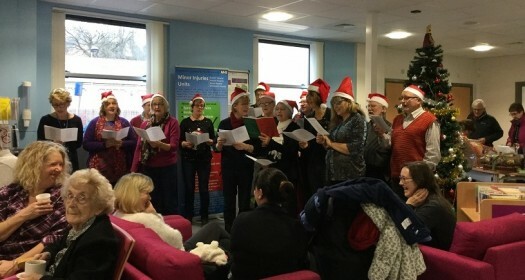 Special thanks to the Ashbourne Singers who each year take time out of their busy concert rehearsal schedule to come along and sing – always one of the highlights of the morning! Thank you also to Optimum, The Olde Sweete Shop and Milkshake Bar, Blooming Beau, Newton House Hotel , The Little Papierie and Wyaston Nurseries for their generous donations; plus the staff of St Oswald’s Hospital kitchen who made the delicious mince pies. We’re so grateful to you all! Careline’s popular Christmas Coffee Morning is FREE to attend & takes place on Friday 2nd December from 10–12.30pm in the foyer of St Oswald’s Hospital, Ashbourne. advance from the main reception in St Oswald’s Hospital or the Careline office. The winning tickets will be drawn during the coffee morning. Come along and enjoy a warm drink and a mince pie whilst the Ashbourne Singers entertain you with carols around the tree – this is a free event, to which everyone is welcome. You’re guaranteed to feel the Christmas spirit, whilst raising some vital funds for your local telephone befriending charity, which offers a free service to support people in and around Ashbourne and Uttoxeter. Our calls are available every day of the year, including Christmas Day. For more information please call the Careline Team on 01335 210353. Take some time out from your busy pre-Christmas diaries to join us for a glass of fizz on Friday 18th November. 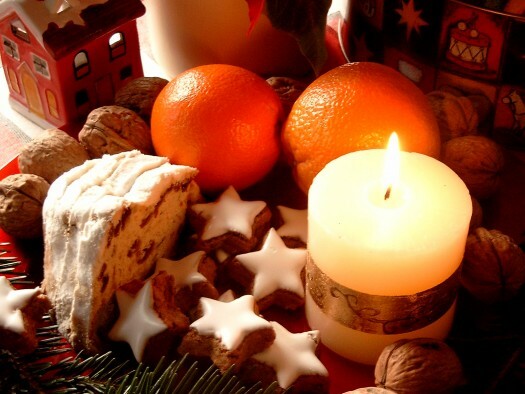 We’ve got 2 entertaining talks lined up – popular make-up artist Esther Marie shares her tips on Christmas evening glamour and talented local candle maker Annie from On A Wick And A Prayer, on Burning the Wick at Both Ends! Plus our therapists will be on hand to treat you to a selection of mini-treatments – you could book a relaxing file & polish, an acupressure massage or a hand and arm massage; or try something new like Reiki or Colour Reiki; you could even book a reading with our clairvoyant! Tickets cost £8.50 incl. a glass of fizz & nibbles. 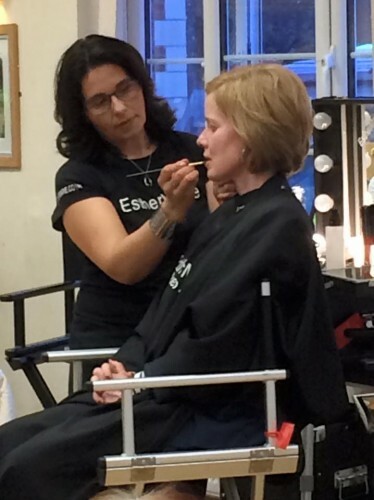 We’re asking for a donation of £5 per treatment – these can be booked in advance or on the evening. For more information, to buy tickets and book treatments visit the Careline office, St Oswald’s Hospital. Alternatively send us a message via our website, Facebook page (Careline Calling) or call us direct on tel: 01335 210353. The event takes place at Clifton Smith Hall, Clifton, Ashbourne DE6 2GJ. Treat yourself before the Festive Frenzy Begins – bring some friends too! 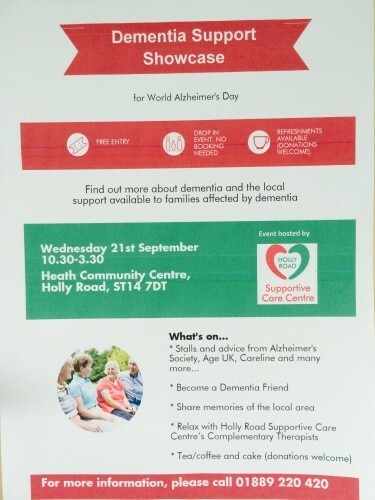 Join Careline and other local organisations including the Holly Road Supportive Care Centre, Alzheimer’s Society and Age UK to recognise World Alzheimer’s Day at a Dementia Support Showcase on Wednesday 21st September 2016. The aim of the day is to enable you to find out more about dementia and the local support available for sufferers and their families. Teas and coffees will be available throughout the day, along with a variety of talks and taster sessions. This event is free to attend and takes place at the Heath Community Centre, Holly Rd, Uttoxeter ST14 7DT from 10.30am-3.30pm. For more information call 01889 220 420. EVERYONE WELCOME. 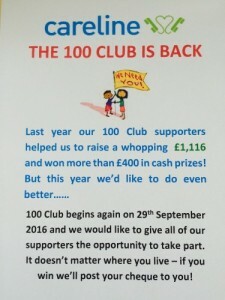 Would you like to join our 100 Club and help us to raise some much needed funds? Would you like to help us raise some funds by joining our 100 Club? It couldn’t be easier and means that we can give something back to you, if your lucky number comes up! You simply pay £24 for the year (standing order, cash or cheque) and we allocate you a number, which will then be entered into our twice yearly draw. You can buy as many numbers as you wish at £24 each. There will be two large cash prizes at each draw, plus several smaller amounts (e.g. 1st prize = £100, 2nd prize = £50, with 6 prizes of £10 ); the remainder of the money is donated to Careline. Call us on 01335 210353 or e-mail: jo@carelinecalling.org.uk for more information or to join. Waitrose Green Tokens Raise £600 Thanks To You! Thank you to everyone who put their green tokens into the Careline box in Waitrose, Ashbourne last month – you’ve helped to raise an amazing £600!! Sadly we haven’t been chosen as Sainsbury’s charity partner of the year, but this certainly helps to make up for the disappointment. Careline has been shortlisted as one of three charities to be put forward to the customer voting stage for Sainsbury’s Ashbourne Local Charity Partner for the year 2016/17, so please can we ask you to vote for us? Sainsbury’s want to make as big an impact as possible in their local communities. So every year they work together with their customers and colleagues to support a local cause at the heart of the local community. 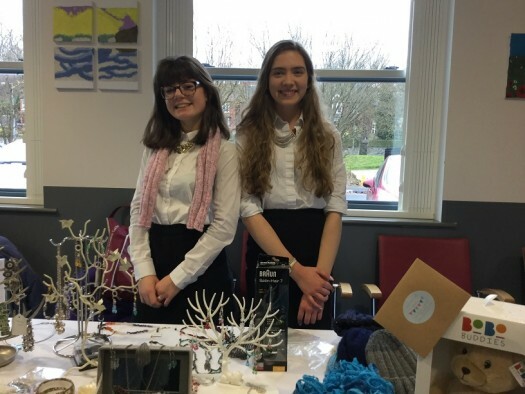 These are holistic partnerships that last for the whole year and include a range of support such as awareness-raising and fundraising in-store, volunteering and donations. As you can imagine this would give Careline a big financial boost in what is proving to be an extremely difficult year. You can vote in-store or online: www.sainsburyslocalcharity.co.uk between 13th – 26th June with the winner selected and announced in early July. You don’t have to be local to vote for us online – simply click on the above link, type in Ashbourne, select the Ashbourne store & our charity will come up. Thank you from all at the Careline Team! Good news! 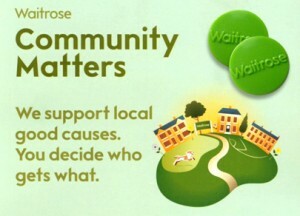 Waitrose Ashbourne have chosen Careline as one of their Community Matters charities for the month of June. So if you shop in the store, our collection box will be ready for lots of green tokens from this Friday, 27th May! Please let your friends and family know too, as this represents a big boost to our funds during a very challenging year.